Russell wins second event of the year. 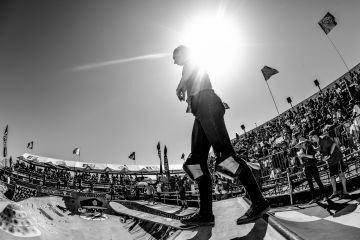 Global Challenger Rankings Set Final Field for Vans Park Series World Championships in Malmö, Sweden. Who will be fronting in the stacked Semi-Finals. Top 8 progress through to the final. Seattle's Sky Siljeg has dropped a massive 91.62 out of 100 to take top spot on the Qualifiers round. Keely Andrew grew up as a competitive-natured, Sunshine Coast kid with her sights set on being a professional athlete. Big sighs of relief at Huntington Beach as four quarterfinalists emerge, with one big surprise. Besides challenging conditions, the girls went big at the Vans US Open. Top seeds continue to impress at Huntington Beach on Day 5 of the Vans US Open. Gilmore, Wright, Peterson and Conlogue secure their spots into the Quarterfinals. The Huntington Beach local earned the highest score of the day with a pair of 8's. 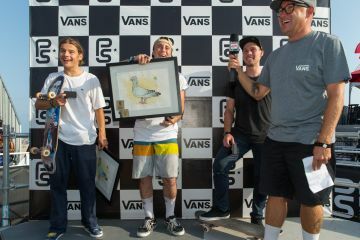 Dark horse Hanna Zanzi finishes on top in Huntington Beach, taking down some of the best skaters in the world. Top seeds take command on a day that required grit to get through at Huntington Beach. The young Australian makes an impressive debut at Huntington, amid a heavily stacked field of talent. Six months after breaking her ankle, the SoCal native made her 2016 season debut Monday at Huntington Beach. Top seeds Conlogue, Moore, Defay and Fitzgibbons relegated to elimination Round 2. Men's QS 10,000 kicks off in exciting fashion. Take a look at some of the top skaters who will battle in the inaugural Vans Park Series Women's competition at Huntington Beach. The 16-year-old Newport native is living up to her family name. Newport Beach's Meah Collins takes the top spot at the Trials and will face the best female surfers in the world. Pro Juniors battle through Rounds 1 and 2 in Huntington Beach. 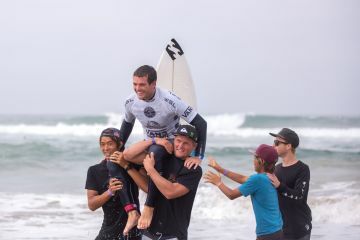 The Hometown hero will compete in the Vans US Open of Surfing QS10,000 event after winning the Trials.